St. Louis, MO (May 5, 2011) – Arenus, a premier provider of innovative health and nutritional products for pets and horses, is pleased to announce that champion combined driver Chester Weber has joined Arenus as an official Arenus Ambassador. 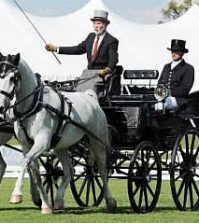 As the eight-time USEF National Four-In-Hand Combined Driving Champion, Weber has proven to be an unstoppable force in the world of combined driving and most recently won the FEI Horse Team division at Live Oak International, one of the premiere combined driving events in North America. As the United States’ most decorated combined driver, Weber also holds an illustrious international combined driving record. 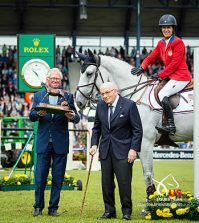 During the Four-In-Hand FEI World Championships in Beesd, The Netherlands, Weber became the first American to win an individual medal. Weber not only finished first in the dressage phase, but also took home the Individual Silver Medal. In addition to this prestigious win, Weber has been ranked in the top ten internationally since 1999. Weber, who has driven for the United States in three World Equestrian Games, is pleased to be an Arenus Ambassador. “We have used Arenus products for quite a while and believe they are quite beneficial. We know the Arenus products are ones we can really trust,” Weber said. Sore No-More, which has twice been voted Product of the Year by the Horse Journal and is a staple in many barns, is a natural arnica herbal horse liniment which features a blend of Witch Hazel, Arnica and other herbs developed to use for muscle fatigue, bruising, swelling and related soreness. Arenus’s Sore No-More family of products includes Sore No-More Liniment, Gelotion, Cooling Clay Poultice, Massage Shampoo, The Sauce and Sports Salve. Arenus also produces Steadfast joint & soft tissue health products, Assure digestive aids, and two products containing DHA/Omega-3- fatty acids. Aleira contains DHA with a proprietary blend of mushrooms to support respiratory health and Releira contains omega-3 fatty acids and other nutrients to support normal reproductive function. To learn more about Arenus products, visit www.arenus.com. For more information on Weber and his combined driving team, visit their website at www.chesterweber.com. Arenus is a premier provider of innovative health and nutrition products for pets and horses. Arenus is a growing division within Novus Nutrition Brands, a global company dedicated to Health and Nutrition through Science. To learn more about Arenus products, or find an Arenus event near you, call (866) 791-3344 or visit www.arenus.com.